The Resident Evil series ends where it began. After 15 years and six movies, Paul W.S. Anderson’s Resident Evil series will come to an end in Resident Evil: The Final Chapter. The films often had a rather loose relationship with the Japanese video game series they were based on, but there are still always some easter eggs hidden in them for dedicated Resident Evil fans. Using the zombie virus outbreak plot from the original 1996 video game, Anderson’s Resident Evil movies created a completely original character named Alice (Milla Jovovich), an amnesiac super-warrior. Alice combats the Umbrella Corporation, the pharmaceutical company behind the zombie outbreak and in the process becomes humanity’s savior. The tidbits that carry over into the films are few, but they’re pretty potent. Spoilers for Resident Evil: The Final Chapter follow. Resident Evil: The Final Chapter engages in some serious retconning at the start of the film. In the second film, Resident Evil: Apocalypse, the evil A.I. Red Queen and the zombie-creating T-Virus were designed by Dr. Charles Ashford, an Umbrella Corp. researcher played by Jared Harris. However, the intro to The Final Chapter completely removes his character from the series, instead attributing the creation of both the Red Queen A.I. and T-Virus to another Umbrella Corp. scientist, James Marcus. While Ashford was an original character, James Marcus is based on the video game character of the same name, who like his film counterpart, was actually a leading member of the Umbrella Corp. and founder of the T-Virus. Fans of both Resident Evil series are likely to be happier with this more canon-friendly change. No, there’s not a huge Resident Evil 7 spoiler in this film if you’re just getting started on the recently released game. There is, however, a cool nod to one of the enemies in Resident Evil 7 in The Final Chapter. Halfway through the movie, a dripping teethed monster that looks like a half-melted action figure begins stalking Alice through a dark warehouse. 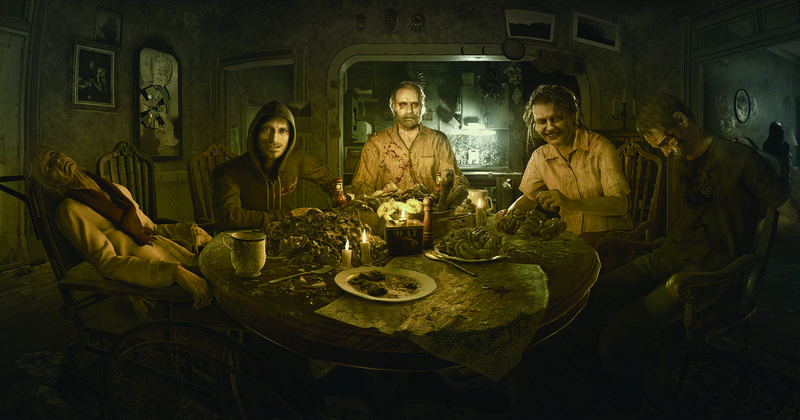 This creature, although bigger in size, looks exactly like a type of enemy called the “Molded” which are new to the series when they make an appearance in Resident Evil 7. One of the hallmarks of the Resident Evil video game franchise are quick time events or choreographed cutscenes where players have to press the correct button on their controllers to avoid being killed by an enemy attack. One of the most famous of these “QTE” is from Resident Evil 4 where the hero Leon Kennedy engages in a knife fight with the mercenary Krauser. The scene features all kinds of knife acrobatics, and anyone who’s played the game remembers it for the sheer absurdity of the fight. Well, that fight is virtually recreated in The Final Chapter when Alice fights with the knife-wielding Alexander Isaacs (Game of Thrones’s Iain Glen), knife acrobatics and all. Here’s an interesting reference. In the first Anderson Resident Evil film in 2002, a scene involving a trap where moving lasers sliced through the heroes was featured. That scene was borrowed in the video game Resident Evil 4, which came out three years later. Now, the laser trap returns in The Final Chapter, possibly the last hurrah for the one moment in the film series that inspired a moment in the video game, and not the other way around. Claire Redfield (Ali Larter), one of the most popular characters from both the video games and the film series returns in The Final Chapter. Originally created for the games as the younger sister of one of the franchise’s main protagonists, Chris Redfield, Claire became a popular character in her own right, starring in several games like Code: Veronica and Resident Evil Revelations 2. Now the character returns after skipping the fifth film, Resident Evil: Retribution, but this time sporting the same outfit she wore in her most recent video game appearance. In a scene directly referencing the opening of the 2001 GameCube remake of Resident Evil, there is a scene partway through the movie where the band of survivors tries to outrun a pack of rabid zombie dogs called Cerberus. This is the first scene in the first video game but happens a bit towards the end in The Final Chapter. Also, unlike the video game where the heroes are running towards a mansion, Alice and the survivors are instead running toward Umbrella’s underground HQ, the Hive. The final Resident Evil film returns the series to where it all began, Raccoon City. The location for both the first film and the first video game, Alice returns to the city after the last couple of films took her across other cities in the East Coast. Even the classic “Welcome to Raccoon City, Home of Umbrella” sign makes an appearance.